Equipment for Education, Engineering and Vocational Training - Bluetooth Trainer & Bluetooth Technology Lab Training System - The Bluetooth Technology Trainer, is designed considering the International Communication Standards. It is helpful for students and researchers in the field of RF and IT engineering to understand the basic concepts of Bluetooth Technology. Based on Class 2 Bluetooth System having range up to 10 meters and is fully compliant for Data Communication. It consists of two identical modules and any one of these can be selected as a Master or Slave for Communication. 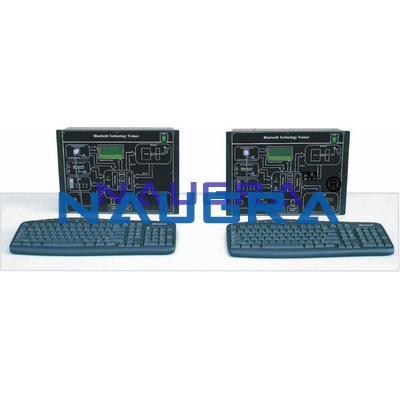 This Training System can be connected to PC for operation and execution of Bluetooth AT Commands. Bluetooth standard AT commands can be run on the graphical LCD display also with the help of keyboard. Graphical LCD display Bluetooth enabled devices detection Designed considering all the Communication Standards Data Generator is provided on-board User friendly software Equipped with UART & USB port Computer independent Training System Test points are provided to observe signals Technical Specifications Carrier Frequency : 2.40 GHz to 2.48 GHz Bandwidth : 80 MHz Modulation : GFSK, 1Mbps No. of Channels : 79 Channel Intervals : 1 MHZ Frequency Hopping : 1600 hops / sec Transmission Power : +4dBm max (2.5mW) Transmission Range : 10 meter approximate Output Interface : UART and USB Power Supply : 230V ±10%, 50 Hz Operating Voltage : 5V Operating Temperature Range : - 20°C to 85°C Antenna : Whip Antenna Scope of Learning Study the functioning of Bluetooth Trainer Pairing of Slave unit with Master unit using software Study of AT commands Data Communication using UART Data Communication using USB Study of Communication using internal data Study of RF signals Optional Handheld Spectrum Analyzer - 3.3 Ghz. We are leading manufacturers, suppliers & exporters of Bluetooth Trainer & Bluetooth Technology Lab Training System for Vocational Training and Didactic Labs. Contact us to get high quality designed Bluetooth Trainer & Bluetooth Technology Lab Training System for Vocational Training and Didactic Labs for schools, colleges, universities, research labs, laboratories and various industries. We accept bulk orders for government tenders in all countries around the globe. For similar products visit at main page of Consumer Electronics Trainers.